If you are suffering from tooth loss, it can be difficult to determine the best restorative treatment for your needs. Many people weigh the benefits of dentures vs. implants, and they find pros and cons to both options. At Sky Dental, we offer Dentures over Implants, which allows you to experience the best of both worlds. As the name implies, Dentures over Implants combine the use of both implants and dentures. The implants are placed into your jaw, and then dentures can be attached to the implants or removed according to your desires. This technique allows the dentures to be more stable in your mouth, offering the extra support that many denture patients desire. After posts are implanted and integrated within the bone structure to support them, dentures can be fastened for an added level of strength. Typically, dentures simply rest on the gums, but in this solution they can have more support beyond the basic denture adhesive over gums. The benefits of this dental treatment lie in the improved chewing power, decreased bone loss, and improved comfort levels of the dentures. What Kinds of Dentures over Implants are Available? 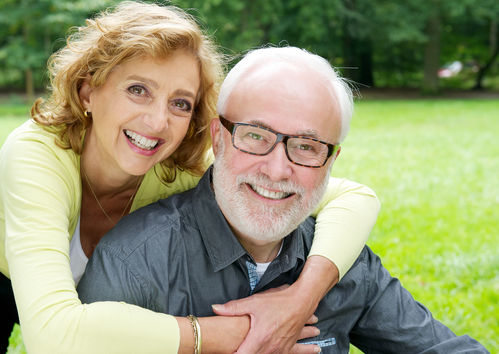 There are two types of Dentures over Implants that are available, and our experienced staff at Sky Dental can help you select the option that best fits your individual needs. Both of these methods involve the use of porcelain and/or acrylic to make dentures that have a natural appearance. Additionally, at least two implants are required for both methods. Bar-Retained Dentures: With bar-retained dentures, a small metal bar is placed in the mouth to follow the natural curvature of the jaw. There are clips fitted on both ends of the dentures so that they can be attached to the bar. Sometimes the clips are fitted on the bar instead of the dentures. When the dentures are put into place, they cover the bar and are held in place by the attachments. Ball-Retained Dentures: Sometimes this method is called stud-attachment dentures, and it requires the use of attachments on the dentures and the bar that fit together. This method also uses a thin metal bar that is placed within the mouth. Both of these options have benefits and drawbacks. A qualified dentist can discuss these with you to help you determine the best solution for your needs. In either case, treatment is a multi-step process that can take anywhere from 5 months to a year to complete. But, it can be well worth the time and effort because of the benefits of a fixed denture over implant solution. Contact Sky Dental to see if you are a good candidate for Dentures over Implants.